We’d love your help. 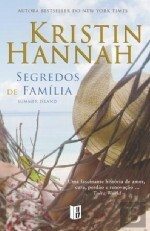 Let us know what’s wrong with this preview of Segredos de Família by Kristin Hannah. To ask other readers questions about Segredos de Família, please sign up. Nora Bridge finds her orderly world turned upside down overnight. She's a famous syndicated radio talk show host, dispensing advice about family and relationship. What the public didn't know was how far away her life was from what she preached. When that was inevitably leaked, Nora returns to Summer Island where she has to come to terms with the world she walked away from a decade before. I liked the story, even though it was fairly predictable. It tackled some strong themes, particularly the mo Nora Bridge finds her orderly world turned upside down overnight. She's a famous syndicated radio talk show host, dispensing advice about family and relationship. What the public didn't know was how far away her life was from what she preached. When that was inevitably leaked, Nora returns to Summer Island where she has to come to terms with the world she walked away from a decade before. I liked the story, even though it was fairly predictable. It tackled some strong themes, particularly the mother-daughter dynamics and the imprint those relationships leave from one generation to the next. Another was the carnage created by divorce, specifically when the children are left in the dark about why the relationship failed and that silence allows them to choose sides. I also liked the contrast between the Bridge family and the wealthy Sloans who vacationed on the island each summer and formed a connection. The two sons, though their parents' marriage was still intact, suffered because of it and neglect. Nora falls prey to a blackmailer who exposes her to her loyal readers and becomes a huge scandal- can she get through this? Hannah always creates moving books and I love that her novels are set in the Northwest. Entertaining and satisfying, Summer Island is a compelling story about mothers and daughters. This novel like her others has an element of sadness and dissension but makes you enjoy the ending and root for the characters. I agree that parts are predictable, but it didn't lessen the enjoyment. I really like this author (I've read 11 of her books) and she does family drama very well. Okay, I am at work, so I'll have to make this review short and to the point. This is the third Kristin Hannah book I have read, and while the first one was very touching ( True Colors ), the last two including this one, have been so-so. I begin to think these books are like Lifetime movies. I don't know why I would watch, they aren't particularly any good... and yet, it is easy to let a wasted few hours go by while a movie (book) full of cliches and emotional manipulation bumbles along. Sometimes Okay, I am at work, so I'll have to make this review short and to the point. I begin to think these books are like Lifetime movies. I don't know why I would watch, they aren't particularly any good... and yet, it is easy to let a wasted few hours go by while a movie (book) full of cliches and emotional manipulation bumbles along. Sometimes they can be touching, and other times I can literally feel braincells slowing down and dying off. This book was no different. The main character Ruby was so predictable as to be nearly one-dimensional. Of course she can't accept love. Of course she hates her mother. Of course she dyes her hair black and wears lots of eyeliner. Of course she feels betrayed by her mother, and therefore, she will betray her back. I was so sick and tired of Ruby that I could not even feel bad for her. And, as one would expect, she miraculously makes up with her mother and falls in love with a rich, successful man that sees through all her many (I do mean many!) emotional flaws and worships her anyway. Summer Island is a very touching story about the power of love through healing and forgiveness. It reminds us that each story has three sides and how sometimes we need to look past our own hurt and anger to renew an old relationship. Summer's Island is sold on it being a book about Mother/Daughter relationships but it is so much more. It is truths hidden behind masks; love lost yet still yearned for. It is pain from being apart from family; and resentment for losing so much time. Kristen Hannah on Summer Island is a very touching story about the power of love through healing and forgiveness. It reminds us that each story has three sides and how sometimes we need to look past our own hurt and anger to renew an old relationship. "Summer Island' deals with a young woman Ruby who is estranged from her famous mother (Nora) and barely talks to her older sister and father who is long remarried with a new child. Readers are slowly walked through these two women's histories and we find out what Nora did to have her estranged from Ruby and partially estranged from her other daughter as well. I liked the character of Ruby. She was feisty, but passionate. Also was totally in the wrong several times so I did feel for her. What was "Summer Island' deals with a young woman Ruby who is estranged from her famous mother (Nora) and barely talks to her older sister and father who is long remarried with a new child. Readers are slowly walked through these two women's histories and we find out what Nora did to have her estranged from Ruby and partially estranged from her other daughter as well. I liked the character of Ruby. She was feisty, but passionate. Also was totally in the wrong several times so I did feel for her. What was good though is that she didn't just stick her head in the sand when she slowly found out her mother's real history which led to her own. I do wonder though how she didn't see what was really going on? I think sometimes you see what you want, and this book takes a mirror up to those who believe that their childhoods were perfect and turns it on their head when it's revealed not so much. I felt for Nora too though I wish we had gotten more involved with her storyline. I liked how the book focuses on Ruby with Nora coming along to give clarity to more and more. I wonder though why she didn't try sooner with Ruby though? Did she not just want to deal with rejection? Was it easier? Considering that Nora's job was an Agony Aunt of sorts it seems surreal she was advising other people on their lives when her life was really not this idealized thing. When Nora's past comes a calling, I think Hannah did a great job showing the repercussions of what would happen. One reason why I gave this only four stars though, is that we don't spend much time with Ruby's sister (Caro) who was dealing with some very real things. I didn't like how her storyline ended up, since it felt tacked on (give everyone a happy ending). It would have worked for me if there was a sequel dealing with Caro and what was going on in her marriage and how she felt overwhelmed as a mother. The other person this book focuses on is Ruby's old boyfriend Dean and his brother who is dying of cancer. I really wish that Dean had been cut out of the book. He added nothing to the story and I find it hard to believe based on what we see of him initially, that he was sitting around pining for his teenage girlfriend. He and Ruby really didn't have any chemistry, and I was more focused on the storyline focusing on Ruby and her mother, and then Ruby and her sister then with him. The writing was really great and the book flowed wonderfully. We get to see the roller coaster of Ruby and Nora's relationship and how flawed things were and why neither one of them really wanted to revisit the past. I didn't have this book on my TBR list. I picked this up last weekend along with another book from this author. I started reading this Wednesday night. Massachusetts is having a heat wave and I do not have air conditioning. I thought this would be a good book to read during the hot, sticky and sleepless nights. I finished reading this story at 4:45 AM this morning. Some books should come with warning labels so you will know the story between the covers may cause you to feel a variety of emotions. I didn't have this book on my TBR list. I picked this up last weekend along with another book from this author. I started reading this Wednesday night. Massachusetts is having a heat wave and I do not have air conditioning. I thought this would be a good book to read during the hot, sticky and sleepless nights. I finished reading this story at 4:45 AM this morning. Some books should come with warning labels so you will know the story between the covers may cause you to feel a variety of emotions. There were times I found my laughter or smile quickly changing to tears. This story is about a woman who walked away from her marriage and her 2 daughters. She becomes a radio celebrity with her own show. She gives advice to callers on a variety of issues. Then something from her past is made public and she becomes undesirable. She gets suspended from her talk show and her fans quickly turn their backs on her. She becomes the latest "news". She finds herself in the house she lived in with her husband and children. Her youngest daughter, who she had no contact with for many years, is staying with her. From that point on unfolds a story of a mother and a daughter trying to find a way to come to terms with each other and a past that caused so much pain. This is a remarkable story in so many ways. A family coming to terms with a painful past, secrets, forgiveness, rebuilding of relationship between a mother and her daughters, loss of a close family friend and the renewal of a childhood romance. A pontuação justa seria 4,5*. Comecei esta leitura com muita expectativa. Às vezes funciona ao contrário mas, desta vez, não me desiludiu. Uma escrita simples, uma história que pode acontecer em qualquer família, e eu senti-me "esmagada" de emoção no final. Adorei Eric, senti um carinho por ele como se fosse da minha família. I can't figure out why this author is so popular. I thought the story line was cheesy and predictable, and the prose uninspired. Wow, I seldom write negative reviews , so you KNOW this book disappointed me! I didn't have very high expectations for this book. I picked it up in a whim for $2, and it sat on my shelf for a good 4 months. What a wasted time! This book was wonderful. Complex and intellectually stimulating. I felt for Nora and was drawn to her despite her flaws. Ruby and Caro were definitely on opposite ends of the spectrum, but it worked so well. As a daughter and a sister, I could easily relate to pieces of them. You look at their family, their story, and see the good and the bad of you I didn't have very high expectations for this book. I picked it up in a whim for $2, and it sat on my shelf for a good 4 months. What a wasted time! This book was wonderful. Complex and intellectually stimulating. I felt for Nora and was drawn to her despite her flaws. Ruby and Caro were definitely on opposite ends of the spectrum, but it worked so well. As a daughter and a sister, I could easily relate to pieces of them. You look at their family, their story, and see the good and the bad of your own. You remember, if only for the moments you are reading, how precious family is and how quickly time passes, and you drift apart. It doesn't matter the intentions or the reasons, this book makes you want to call your loved ones just to take advantage of the moments you do have. Family is about fighting, forgiving, accepting, and loving; not only one another but yourself. I loved that Nora, despite her flaws, could see through the bad and help those in the wrong direction. I didn't feel she was a hypocrite, just lost on her journey to find herself, and make peace with her past. My favorite character was Eric. I loved his honesty and outlook on life. His character was deeply developed even though we didnt/couldn't interact with him the way we could the other characters. I wept for him. It's no surprise, we prepare for it all along, but you never think you will be so enveloped in a character until the final moments hit you. I hated his parents and their selfishness, but realize the gift that his suffering gave to Nora and Ruby. Mais um livro intenso, arrebatador e emocionante. Sempre com temas actuais, que nos levam a ler o livro de uma assentada. Sendo as primeiras paginas sempre mais "leves" para entrarmos na história, depressa damos conosco numa montanha russa de emoções. Se depois do primeiro livro que li dela, fiquei fã, cada leitura nova dá-me vontade de ler mais e mais. This book was a huge let down for me. The characters were miserable people and I couldn't feel an ounce of love for them and believe me I tried! The story was predictable, full of cliches and cheesy like a badly written soap opera. The author threw in a romance in there towards the end that she hardly bothered to develop well. This was one of Kristin Hannah's earlier books, thus it explains the vast chasm between this one and the Great Alone, a 5 star book I read and loved last year. Nora Bridge had what appeared to be the American dream – a devoted husband, two loving daughters, and a quaint beachhouse on Summer Island. Yet one day she turned her back on them all and vanished into thin air. A decade later her youngest daughter Ruby finds herself grappling with the heartbreaking legacy of her mother’s selfishness. Stuck in the spin cycle of financial and emotional debt, Ruby is listless, angry and desperate to make a buck. After Nora, ironically a nationally beloved radio ad Nora Bridge had what appeared to be the American dream – a devoted husband, two loving daughters, and a quaint beachhouse on Summer Island. Yet one day she turned her back on them all and vanished into thin air. A decade later her youngest daughter Ruby finds herself grappling with the heartbreaking legacy of her mother’s selfishness. Stuck in the spin cycle of financial and emotional debt, Ruby is listless, angry and desperate to make a buck. After Nora, ironically a nationally beloved radio advice show host of “Family First,” becomes the center of a scandal, Ruby decides to make a quick buck by writing a tell-all roast about her absentee mother for a sleazy tabloid. Just when life couldn’t get worse for poor Nora, she wreaks her car in an alcohol-induced haze, rendering herself incapacitated in a wheelchair. Alone and helpless, she’s left to rely on the one person who despises her the most: Ruby. Guilted into taking care of her down-trodden mother at her childhood home in Summer Island, Ruby decides to maximize her quality time with mother dearest by writing her tell-all. But when her anger ebbs and forviness fights its way to the surface, she sruggles with the moral dilemma of cashing in on her mother’s scandal or killing the story and letting her mother back in her heart. Lessons of redemption and second chances are also infused in the two subplots: one a romance between Ruby and Dean, an old boyfriend who she ditched after her mother left, and another involving Dean’s dying brother with only days left to make peace with his broken family. Conveniently they’re all summering on the island and rebuilding their relationships. Brimming with sentiments of forgiveness and unconditional love, the book reads like a lengthy episode of a Lifetime movie under the influence of “Delilah after Dark.” Get out those boxes of Kleenex ladies, this one is a surefired tearjerker. This is the 10th Kristin Hannah I have read this year. I think I have mentioned a few times before that she and Jodi Picoult are probably my two favorite authors. They both have a style of writing that I am drawn to, and I have never been disappointed in any of their books. "Summer Island" was certainly no different. Summer Island is about advice expert Nora Bridges, the two daughters she abandoned years ago (Ruby & Caroline), and some other wonderful characters (Eric the homesexual cancer pa This is the 10th Kristin Hannah I have read this year. I think I have mentioned a few times before that she and Jodi Picoult are probably my two favorite authors. They both have a style of writing that I am drawn to, and I have never been disappointed in any of their books. Summer Island is about advice expert Nora Bridges, the two daughters she abandoned years ago (Ruby & Caroline), and some other wonderful characters (Eric the homesexual cancer patient and his brother, Dean). I was completely sucked in from Page 1. The author has a way of making my feel very strongly about each of the characters. Nora becomes involved in a tabloid scandal, and she winds up being injured in a car accident -- her fault, because she was so depressed she drove in a drunk stupor right into a tree. When the tabloid scandal gets seriously revved up, Nora decides to hide away for a while at her old lake house. Her estranged daughter Ruby gets talked into caring for her injured mother for a week. I was surprised that this book make me so emotional, as I shed a lot of tears while reading -- especially in the last half. I read a version of this book which was released through epub, and thus there were some formatting and grammatical errors which were somewhat distracting, but the story still sucked me in. i found myself quickly unable to put this book down. so it was good that this was a quick read, taking less than 24 hours to finish. the story is reminiscent of a lifetime drama: a woman walks out of her marriage and is demonized by her two children. years later, her successful career veers off course and she finds herself recouping from a dui accident. her estranged youngest daughter returns under the guise of caring for her mother, but secretly plans to write a tell-all article about her. instead, the daughter learns to love and live again. while the dialogue does feel a little forced at times, and while the transition from hatred to love does seem to happen on a short time-line, this book teaches us the lesson that if we assume we have all the answers, we never really do. I enjoyed listening to this story, which is told from the alternating points of view of successful radio host Nora, a woman who preaches to the nation about the importance of family, among other things, and (ironically enough) her estranged daughter, the angry aspiring comedian, Ruby. When pornographic pictures from Nora’s past emerge, proving that she had an affair while married, her image of being a family values icon are shattered, and her career is in tatters. Ruby’s career has never gotten st I enjoyed listening to this story, which is told from the alternating points of view of successful radio host Nora, a woman who preaches to the nation about the importance of family, among other things, and (ironically enough) her estranged daughter, the angry aspiring comedian, Ruby. Ruby’s career has never gotten started, but the downfall of her mother leads to opportunities for her. Ruby has been angry with her mother since she abandoned Ruby and her sister Caroline when they were young. Nora wants to hide out from the media and the world on their house on Summer Island, but a car accident means that she needs help. Ruby comes to help her mother—and gather material for the tell-all article she’s been given big bucks to write. While the ending is not some big twist, there is romance and nostalgia that make this an enjoyable read. More important, this book is about the complex bonds of family, specifically mother/daughter relationships. This is the first novel I have read by this author and I have to say I LOVED THIS BOOK - THANKS DONNA for the recommendation! What a wonderful story!! Nora Bridge is a radio talk show host that espouses the morals of a nation. People trust and love her. When pornographic pictures of her are released to the press, her carefully constructed world comes tumbling down around her and she is faced with the skeletons in her closet that have left her estranged from the two daughters she has loved from a This is the first novel I have read by this author and I have to say I LOVED THIS BOOK - THANKS DONNA for the recommendation! What a wonderful story!! Nora Bridge is a radio talk show host that espouses the morals of a nation. People trust and love her. When pornographic pictures of her are released to the press, her carefully constructed world comes tumbling down around her and she is faced with the skeletons in her closet that have left her estranged from the two daughters she has loved from a distance for the past 11 years. The Journey back is a tumultuous one when Nora finds herself injured in a car accident and her daughter Ruby, who has nurtured her hatred since the day her mother left them, comes to care for her at the family home on Summer Island. The memories flood back and secrets are revealed that paint an entirely different picture of a time that Ruby was so sure of. Suffice it to say, things are not what she expected. I was hooked after the first 50 pages, even the night couldn't stop me. The story made me cry, I gasped for breath as I read some sentences, they touched my heart so deeply. Love and pain. Being loved and missing love. The non-expressed words are so painful, they torn apart and make devastation in hearts. I think my heart has not opened yet entirely, thus I was shocked as I was reading about Bridge family, their story, their feelings, their life were very heart-breaking to me, I couldn't escape from them, I had to read them in order to help to heal mine. In my family also there is a "scandalous" secret, some parts of it have already been unfolded, but painful emotions are still deeply buried inside our heart. Why? Because we are afraid of telling our feelings, our sorry-s, our I-love-you-s to each other, those moments makes us so vulnerable, and if the heart is not enough strong inside, the silence seems easier, but we should pay its price alter. My 3 star rating is being generous on my part. This book was very predictable and cheesy beyond imagination. The character Ruby totally unbelievable. She goes from one personality to a completely different personality within a few weeks? The anger and family time lost could have most likely been eliminated if the mother would have written a letter to her daughters and explained in total honesty what happened to both her and her ex. To believe somebody would not do so is pure stupidity. While mental My 3 star rating is being generous on my part. While mental illness varies from individual to individual, how could the mother not tell her daughters her state of health? From what we know, if a parent suffers from mental illness, changes are good children may also suffer in some capacity. What a self-centered woman! This book got the rating it did because when I got done reading it, I was so frustrated that I took my valuable time to read this predictable story with unlikeable characters. Any author that can get me that upset deserves something. I certainly did not lose any brain cells reading this book. Mighty love mixed with gripping, emotional storytelling explains this story. Kristin Hannah did an excellent job bringing alive the depth of the characters loves each other. Most love stories fall short when it comes to readers connection to the main couple. The characters were so toxifying to read it became addicting. The story showcases love through forgiveness and I believe that's an important factor to embark as a romance reader. You probably think I'm talking about a love between lovers but Mighty love mixed with gripping, emotional storytelling explains this story. Kristin Hannah did an excellent job bringing alive the depth of the characters loves each other. Most love stories fall short when it comes to readers connection to the main couple. The characters were so toxifying to read it became addicting. The story showcases love through forgiveness and I believe that's an important factor to embark as a romance reader. You probably think I'm talking about a love between lovers but on the contrary, I'm talking about a mother and daughter bond. It;s deep connection that has it's ups and downs but healing wins. Emotions vary while reading this book. The struggles of the couple are firmly showed with description and similes. Kristin Hannah fails to disappoint me. This one wasn't my favorite, but the characters were superb. I love the fact KH can deliver a tale that could be from anyone's private journal and make such an impact with it. Of course, there are tears as well as happiness, and each page is a true gem. Hannah's forte is characterization, and I adored Ruby's character, and how each one has their own sub-story with the other characters. The pacing is good and the changes the characters go through are well-don Kristin Hannah fails to disappoint me. Hannah's forte is characterization, and I adored Ruby's character, and how each one has their own sub-story with the other characters. The pacing is good and the changes the characters go through are well-done, and the choices they make based on their pasts that forever alter the future and the subsequent relationships--unbelievably believable! Nicely done. I loved this book because the conflict was so real and made total sense. A mother walks out on her family and her daughter hates her. Fast forward many years and the daughter suddenly has to help her mother but is offered a lot of money to do an expose on her mother. It was fascinating to watch the main character develop. I absolutely love Kristin Hannah books! This particular book I picked up at the library and had very low expectations for. I was very surprised at how much I really enjoyed it. A story about relationships and forgiveness. It will make you laugh and cry. I highly recommend. I listened to this book in the car - sometimes depressing, sometimes thought-provoking, Im glad I listened to it. But I think I'm ready for a break from this author. Enjoyed reading the story of family and particularly mom and daughter(s) relationship. This was good for a summer vacation read...but was definitely predictable. Not much for character development.